This product is currently being updated. It will be available soon! 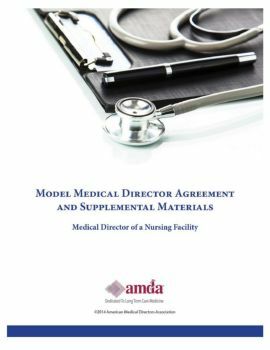 This package serves as a guide for agreements for medical director services in nursing facilities. It includes a model agreement between the medical director and the nursing facility; performance requirements and the roles and responsibilities of a medical director; AMDA’s statement on compensation for medical director services; and Centers for Medicare & Medicaid Services (CMS) requirements for medical directors; as well as information relevant to the updated Medical Director 501 FTag and Stark II prohibition on physician self-referral. *The Electronic Copy is in FlipHTML5 format, and is viewable from your PC, tablet and smartphone through your AMDA account. The Electronic Copy is downloadable and printable.